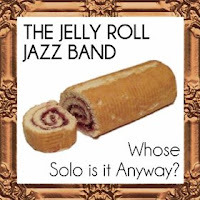 bebop spoken here: CD review: The Jelly Roll Jazz Band - Whose Solo is it Anyway? CD review: The Jelly Roll Jazz Band - Whose Solo is it Anyway? Dan Wackett (bjo); Michael Grant (clt/spoons); Laurence Marshall (tpt/tmb/vcl); Ben Sarney (bs). The sleeve says that the Jelly Roll Jazz Band [above names] are listed in reverse alphabetical order according to the penultimate letter of their surname. This gave me the idea that this isn't a disc to be taken too seriously! It's a fun band! And if you're having a Prohibition Party, this is the band for you. Lots of tried and tested favourites such as When the Saints; Bourbon St. Parade; Five Foot Two; Sheik of Araby; Just a Closer Walk With Thee; St. James Infirmary; Margie; Moon River; Bare Necessities; Ice Cream; When You're Smiling; 14 seconds of In the Mood and an unlisted blast on Bill Bailey. Nowhere else will you hear such heart-rending interpretations of the core banjo repertoire , say's the press release. A fair description. Got to be the best party band in Scarborough which is where they are hiding out from the Jazz Police. Visit them on Facebook.